I absolutely love your siggie! Whoops! I mean Angie! Sorry, Angie. Why, hello there Anjie. I am ever so sorry that I did not reply back to the Visitor Message. I can't remember, but maybe I saw you, or someone with a similar name! Ha, ha ha ha! However, I would really like it if we could meet up on Bearville sometime soon. What team are you on for the Easter Egg Hunt? I am on Team GreenTracks. Right now its 21: 28 pm here in the UK. Also, are you a boy or a girl? Sorry if that sounds rude. Anyway, have a great night! Hey, I know most of the time I visitor message you about that I saw you on Build-A-Bearville, and well, I'm doing it again! So, here I am, on your page, writing to you that I did infact, see you on Bearville today. It is rare that I see one of my Bearville Insider friends on Build-A-Bearville, but I did today, and I just wanted to visitor message you to tell you well, basically - I saw you! How are you today, Angie? Sorry I'm talking for so long, its just, well, I'm quite lonely because Bearville Insider doesn't have many people online at 20:53pm UK time, as that is something like 12:54pm USA time, basically morning in Pacific, Mountain, Central, EST, USA, and Toyko, and Japan, also Thailand. I saw you on Bearville, how are you? Lol! Hey! I saw you on Bearville. Maybe we can meet tomorrow? I've got to go now, so I'll talk to you tomorrow. See you soon, Angie! 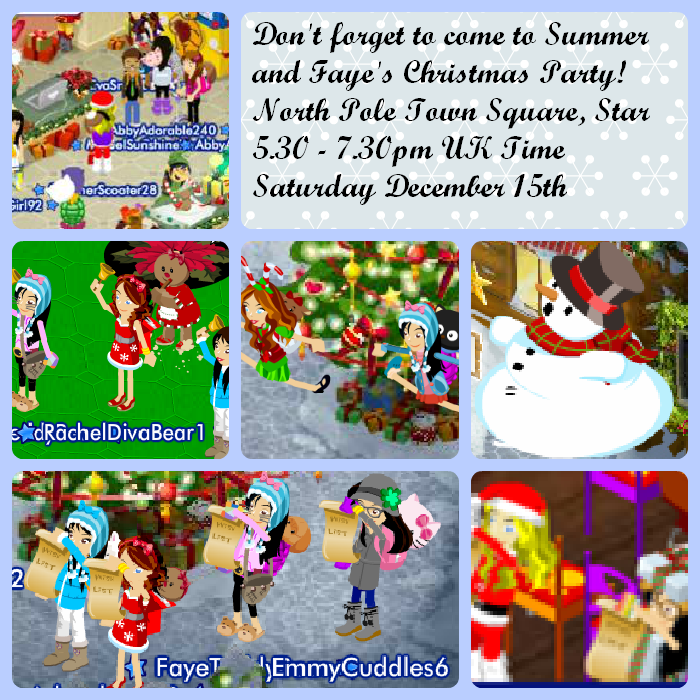 Summer and Faye's Biggest, Best, Christmas Party Ever! TOMORROW! The Party is Tomorrow! Please remember to come! Wear something christmassy! i am a MARSHALL LEE fan. are you?